Child abuse is often misdiagnosed and under recognized by physicians and caregivers. Child abuse occurs in many forms and is best defined as purposeful infliction of physical or emotional harm, sexual exploitation, and/or neglect of basic needs (eg, nutrition, education, medical care). Child abuse is an important cause of death in children. Among child abuse fatalities, head injury is the leading cause of death in infancy. Shaken baby syndrome (SBS) is of particular interest to the neurologist, as it affects the nervous system. Shaken baby syndrome may cause long-term sequelae in the developing nervous system, and the effects may even be lethal. See the image below. 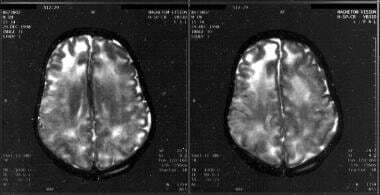 T2-weighted MRIs show encephalomalacia after shaken baby syndrome. The term "shaken baby syndrome" has been commonly used to describe symptoms consistent with shaking an infant, which produces bilateral retinal hemorrahge and diffuse brain injury. However, the term shaken impact syndrome is used for injuries that exceed those just from shaking and have evidence of blunt head trauma. "Abusive head trauma" is now the recommended term by the American Academy of Pediatrics. This term describes the type of injury rather than the mechanism of injury. Anatomic features make infants especially prone to neurologic injury from excessive shaking or trauma. Infants have a large head compared with their body size, and the cervical paraspinal muscles are weak. (This accounts for head lag observed during the first month of life.) The infant brain has a higher water content than that of the adult brain, and it is incompletely myelinated. The subarachnoid spaces are also larger in infants than in adults, given the small size of their brains. When the infant is shaken, movement of the immature brain in relation to the skull and the poor muscle tone in the neck cause the bridging vessels to tear, resulting in the classic finding of a subdural hematoma. Retinal hemorrhages are produced when venous congestion causes rupture of the retinal vasculature. Therefore, shaken baby syndrome is defined by subdural hemorrhage and retinal hemorrhage. One additional feature is occult fractures, particularly of ribs and long bone metaphyses. The mechanism by which brain damage occurs is controversial. Traditionally, shearing forces from direct trauma were believed to cause axonal damage. Geddes et al suggested hypoxia-ischemia as the mechanism rather than axonal injury that is seen in older children and adults with lethal head trauma. [7, 8] They also thought that acceleration and deceleration forces may damage the neuraxis to cause apnea, with consequent ischemia and cerebral edema. Biomechanical studies of infant trauma injuries have shown that the magnitude of angular deceleration is 50 times greater when the infant's head strikes a surface than when he or she is only shaken. This force is distinct from those of other accidental traumas that occur in infants. This evidence suggests that the term shaking-impact syndrome is more accurate than shaken baby syndrome. The perpetrator is usually alone with the victim. Men are the abusers in 90% of cases. The abuser is usually the biologic father or, in some cases, the mother's boyfriend. The most common female attacker is a babysitter. In 2009, 3.3 million cases of child abuse and neglect were reported. Of these, 331,500 cases were substantiated. About 20.282% of the affected children were younger than 3 years, and 20.6% were younger than 1 year. The typical abused child is younger than 6 months. Caffey J. Multiple fractures in long bones of infants suffering from chronic subdural hematoma. AJR Am J Roentgenol. 1946. 36:163-73. Kempe CH, Silverman FN, Steele BF, et al. The battered-child syndrome. JAMA. 1962 Jul 7. 181:17-24. [Medline]. Gilkes MJ, Mann TP. Fundi of battered babies. Lancet. 1967. 2:468-9. Caffey J. On the theory and practice of shaking infants. Its potential residual effects of permanent brain damage and mental retardation. Am J Dis Child. 1972 Aug. 124(2):161-9. [Medline]. American Academy of Pediatrics. Abusive Head Trauma in Infants and Children. Pediatrics 2009. 2009 May. 123:1409-1411. [Full Text]. American Academy of Pediatrics. Understanding Abusive Head Trauma in Infants and Children: Answers from America's Pediatricians. American Academy of Pediatrics. Available at https://www.aap.org/en-us/Documents/cocan_understanding_aht_in_infants_children.pdf. 2015 Jun 01; Accessed: 2018 Jan 12. Geddes JF, Hackshaw AK, Vowles GH. Neuropathology of inflicted head injury in children. I. Patterns of brain damage. Brain. 2001 Jul. 124(Pt 7):1290-8. [Medline]. Geddes JF, Vowles GH, Hackshaw AK, et al. Neuropathology of inflicted head injury in children. II. Microscopic brain injury in infants. Brain. 2001 Jul. 124(Pt 7):1299-306. [Medline]. U.S. Department of Health and Human Services. National Statistics on Child Abuse. Child Maltreatment 2015. 2015. Available at https://www.acf.hhs.gov/sites/default/files/cb/cm2015.pdf. Child Welfare League of America. Missouri's Children at a Glance. Missouri's Children 2017. April 2017. Available at http://www.cwla.org/wp-content/uploads/2017/03/MISSOURI.pdf. Child Welfare League of America. Illinois's Children at a Glance. Illinois's Children 2017. April 2017. Available at http://www.cwla.org/wp-content/uploads/2017/04/ILLINOIS-revised-1-1.pdf. Missouri Department of Social Services Children's Division. Missouri Child Fatality Review Program Annual Report from 2011. Available at http://www.dss.mo.gov/re/pdf/can/cancy11.pdf. Accessed: June 24, 2013. HHS. U.S. Department of Health and Human Services: Administration for Children and Families. Child Maltreatment 2011. [Full Text]. Kanter RK. Retinal hemorrhage after cardiopulmonary resuscitation or child abuse. J Pediatr. 1986 Mar. 108(3):430-2. [Medline]. Brian Forbes, MD, MPH. Abusive head trauma in infants and young children: Ophthalmologic aspects. UpToDate. Available at http://uptodate.com/contents/abusive-head-trauma-in-infants-and-young-children-ophthalmologic-aspects. Accessed: July 27, 2011. Cindy Christian, MD Erin E Endom, MD. Evaluation and diagnosis of abusive head traum in infants and children. UpToDate. Available at http://www.uptodate.com/contents/evaluation-and-diagnosis-of-abusive-head-trauma-in-infants-and-children. Accessed: July 27, 2011. Madonna Behen. Abusive Head Trauma in Infants Doubled During Recession: Study. US News And World Report. Available at http://health.usnews.con/health-news/family-health/brain-and-behavior/articles/2011/04/13. Accessed: July 22, 2011. Ludwig S, Warman M. Shaken aby Syndrome: a reiew of 20 cases. Ann Emerg Med. 1984 Feb. 13 (2):104-7. Christian CW, Block R. Abusive head trauma in infants and children. Pediatrics. 2009 May. 123(5):1409-11. [Medline]. Alexander R, Sato Y, Smith W, Bennett T. Incidence of impact trauma with cranial injuries ascribed to shaking. Am J Dis Chld. 1990 June. 144(6):724-6. Andreadou E. Yapijakis C, Paraskevas GP, et al. Hereditary neruopathy with liability to pressure palsies: the same molecular defect can result in diverse clinical presentation. J Neurol. 1996 Mar. 243 (3):225-30. Bruce DA, Zimmerman RA. Shaken impact syndrome. Pediatr Ann. 1989 Aug. 18 (8):482-4, 486-9, 492-4. Coody D, Brown M, Montgomery D, et al. Shaken baby synddrome: identification and prevention for nurse prctitioners. J Pediatr Health Care. 1994 Mar-Apr. 8(2):50-6. Donohoe M. Shaken baby syndome (SBS) and non-accidential injuries (NAI). Vaccine Website. Available at http://www.whale.to/v/sbs.html. Accessed: March 18, 2009. Duhaime AC, Alario AJ, Lewander WJ, et al. head injury in very young children: mechanisms, injury types, and ophthalmologic findings in 100 hospitalized patients younger than 2 years of age. Pediatrics. 1992 Aug. 90 (2 Pt 1):179-85. Duhaime AC. Gennarelli TA, Thibault LE, et al. The shaken baby syndrome. A clinical, pathological, and biomechinical study. J Neurosurg. 1987 Mar. 66(3):409-15. Ewigman B, Kivlahan C. Child maltreatment fatalities. Pediatr Ann. 1989. 18(8):476-8, 480-1. Geddes JF, Plunkett J. The evidence base for shaken baby syndrome. BMJ. 2004 Mar 27. 328(7442):719-20. Giardino AP, Christian CW, Guardino ER. A Practical Guide to the evaluation of Child Physical Abuse and Neglect. Thousand Oaks, Calif: Sage. 1997. Hahn YS, Raimondi AJ, McLone DG, Yamanouchi Y. Traumatic mechanisms of head injury in child abuse. Childs Brain. 1983. 10(4):229-41. Ingrahan FD, Matson DD. Subdural hematoma in infancy. J Pediatr. 1944. 24:1-37. Lancon JA, Haines DE, Parnet AD. Anatomy of the shaken baby syndrome. Anat Rec. 1998 Feb. 253(1):13-8. Manning SC, Casselbrant M, Lammers D. Otolaryngologic manifestations of child abuse. Int J Pediatr Otorhinolaryngol. 1990 Sep. 20(1):7-16. Singer HS, Kossoff EH, Hartman AL, Crawford TO. Shaken baby syndrome (shaken-impact syndrome). Treatment of Pediatric Neurologic Disorders. Taylor& Francis; 2005. 329-344. Spaide RF, Swengel RM, Scharre DW, Mein CE. Shaken baby syndrome. Am Fam Physician. 1990 Apr. 41(4):1145-52. Truth Foundation. Shaken Baby Syndrome: Questions and Controversies. Truth Foundation. Available at http://sbstruth.com/Questions%20and%20controversies.htm. US Department of Health and Human Services. Administration for Children and Families. Factsheets/Publications. Child Maltreatment Reports. Child Maltreatment 2006: Reports from the States to the National Child Abuse and Neglect Data Systems. Available at http://hyyp://www.acf/hhs.gov/programs/cb/publications/cmreports.htm..
Wilkinson WS, Han DP, Rappley MD, Owings CL. Retinal hemorrhage predicts neurologic injuryi n the shaken baby syndrome. Arch Ophthalmol. 1989 Oct. 107 (10):1472-4. CT scan shows a subdural hematoma. CT scan shows cerebral edema with loss of gray matter–white matter distinction. T1-weighted MRIs reveal bilateral chronic subdural hematomas as well as severe encephalomalacia involving the parietal, occipital, and temporal lobes. T1-weighted MRIs show chronic bilateral subdural hematomas. Sagittal MRIs show chronic subdural hematoma. Funduscopic image shows intraretinal hemorrhages, subhyaloid hemorrhages, localized hemorrhagic choroid detachments, and thin retinal folds. Flair and T2 images reveal intrahemispheric bleeding. Fast Five Quiz: What Do You Know About Drowning? When a Child's Parents Don't Comply With the Plan of Care, What Should the Clinician Do?